1) The Boom Goes Bust. 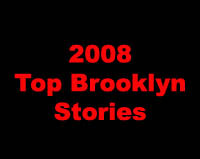 Parts of Brooklyn–Downtown, Williamsburg and Greenpoint–to name a few, will turn out to be Ground Zero of the spectacular Development Crash of 2008. The city’s awful failure to plan for growth will be replaced by its failure to deal with the wrecked urban landscape of abandoned and bankrupt projects that its policies encouraged. 2) The Atlantic Yards Meltdown. Who could have predicted that by the end of 2008 the discussion would center around whether the mega-project would ever be built? During the year we saw talk of a “stall” and a “halt.” There was a dramatic scaling back of Miss Brooklyn. The timetable for building affordable housing slipped. Landscape architect Laurie Olin left the project. And Architect Frank Gehry laid off people working on the project. Our prediction: Developer Bruce Ratner will have difficulty obtaining financing for a nearly $1 billion Gehry arena and the arena will either be scraped or a new version from an off-the-rack firm for $500 million will be built. There are also significant odds the entire project will be canceled if the tanking Nets are sold and go to Newark. We now give the project odds of 50-50 at best. And, by “project,” we mean an arena surrounded by seas of parking. A pox on the officials that allowed demolition to go forward and decimate part of Prospect Heights, including destruction of the historic Wards Bakery. 3) The Coney Island Mess. From beginning to end, the city’s attempt to redevelop Coney Island has been an embarrassing, amateurish and short-sighted mess. The behavior of developer Joe Sitt is beneath contempt, but not far behind is that of the pubic officials who have failed to plan for an interim period of 5-10 years when NOTHING may happen in Coney. By allowing egotistical dreams of grandiosity to rule the day, the city may have guaranteed frightful mediocrity, if not ruin. 4) The IKEA-fication of Red Hook. Our big blue-and-yellow friend opened in June, changing the look of the Red Hook waterfront forever. The addition of the waterfront esplanade was a nice touch, but the overall impact still leaves that part of Red Hook feeling like Paramus. Fortunately, the nightmare visions of congestion and out-of-control traffic did not materialize. 5) The Kent Avenue Boom. The tree planted with rezoning in 2005 has borne fruit and Kent Avenue in Williamsburg has now morphed from a wasteland to 30-story towers. These are neighborhood transforming developments. Will they tank or thrive? 6) The Saving of 184 Kent. One has to love irony. The historic Austin Nichols Warehouse, which the City Council insisted on de-landmarking, is being preserved thanks to a developer using historic preservation tax credits. Irony, anyone? 7) The Flatbush Avenue Boom. The row of luxe residential projects going up are changing the skyline–Toren, Oro, Avalon Fort Greene and others. Again, will these projects thrive or turn into disasters? 8). The Survival of Admirals Row. If the Brooklyn Navy Yard Development Corp. had its way, Admiral’s Row would no longer exist. Yet, the crumbling buildings are still there and an obscure Federal agency is trying to determine whether they should be saved. This is one case where we hope and pray the Feds stick it to the city and make them preserve an important part of American history. 9) Death of Red Hook Waterfront Redevelopment. The stevedores, as it turned out, managed to throttle the city’s grand plan to build a massive mixed-use development in what we’ll call the Columbia Waterfront District. Good riddance. 10) The Gowanus Renaissance. Depending on one’s perspective and the issue this is either a good thing or a bad thing. Clubs are opening. Hotels are being built. The Toll Brothers project on the Canal is likely to be approved and a major rezoning will be done, now linked to a downzoning of Carroll Gardens. Meanwhile, the Whole Foods projects is stalled and may still sink into the toxic muck in which it would be built. Will any of this amount to anything? Probably not for another decade or so when another boom cycle starts. 4) The IKEA-fication of Red Hook. Gasp! People in the Red Hook Houses getting jobs with healthcare benefits? That can’t be more important than preserving the bleak post-industrial atmosphere that we all love. Truly a tragedy for Brooklyn. Agree with you on the others though. +1. Living just down the street from Ikea, I was one of the many knee-jerkers opposing it, but I gotta say it’s won me over.